Does This Look Like Dinner? I fretted for a day or so after my post about 2012 food trends, because I forgot to mention one of the most interesting: food and drinks made from conifers. Then I realized this trend is entertaining enough to warrant its own post. So take another look at your wreath, tree, or centerpiece. Go beyond scent—think flavor. I bumped into this needle-ish trend while doing errands and listening to a segment of Lynne Rosetto Casper of "The Splendid Table" interviewing Rachel Saunders (the December 3, 2011, edition. at the 23:00 minute mark). Saunders, author of The Blue Chair Jam Cookbook, said, "I had this pine cone bud syrup, and..." Right about there I became a dangerously distracted driver even though I was neither texting or talking. Pine cone bud syrup took up my whole brain for a few seconds. Saunders said she figured out that since herbs go well with pear, pine cone bud syrup would go well with pears, so she developed a recipe for Pear Jam with Rosemary and Pine. From a little googling, and—full transparency—zero tasting on my own, it appears pine, fir, and conifer flavors are being used in savory and sweet foods, and in seltzers and cocktails. Most of the recipes require a syrup and assume the cook will make that syrup, rather than buying it. It took me a while to find sources available in the USA, because I was looking for things like "Douglas Fir syrup" or "pine needle syrup," and the exact language needed to be what I had first heard on the radio: "pine cone bud syrup." Once I saw the prices, homemade syrup still seemed the best idea. One recipe for making fir needle syrup by packing needles in sugar and waiting several months suggests the syrup is a specialty "here in Slovenia." Another approach cooks up a simple Evergreen Syrup in minutes, provided you have first washed and dried your fresh evergreen bough. Between the fresh greenery and the syrup, most of a meal can taste like an evergreen forest. Warm up your guests with Pine Needle Daiquiri topped with Douglas Fir bubbles (which require bit of molecular gastronomy as well as homemade Douglas Fir syrup). For the main course, steep pine needles in Bourbon and fire up the grill for Pine-Smoked and Maple-Glazed Salmon. Follow with an aromatic dessert, Orange Cupcakes with Green Pine Needle Frosting. Then sit by a crackling pine-log fire sipping Douglas Fir Eau de Vie. 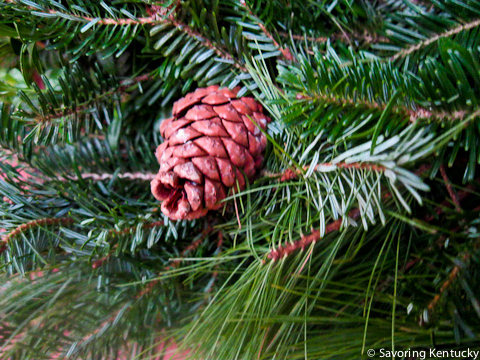 In this country, pine and other conifers may have some history as medicines as well as food. If you feel a cold coming on, visit your pine tree and make a pine needle gargle or a pine needle steam infusion to clear your head. I'm intrigued with all these developments.